Los Angles has the second largest school district in the nation…. 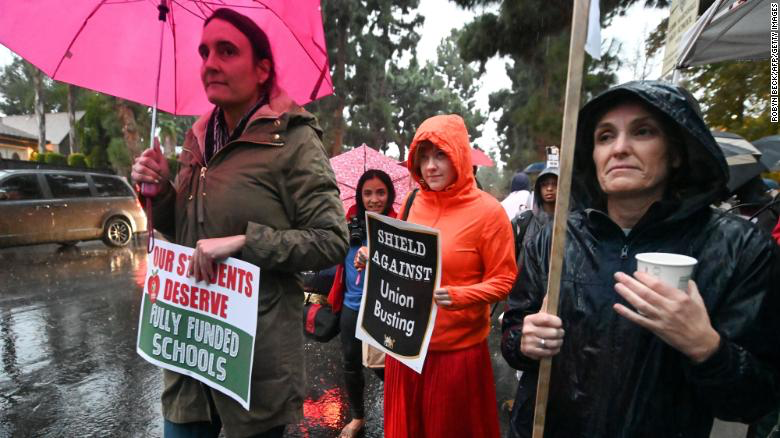 It was still dark when physical education teacher Lin Joy Hom rolled up about 6:15 a.m. to the gate that leads to the Marshall High School parking lot on Griffith Park Boulevard, with “UTLA strong” emblazoned in red letters on her car windows. Fellow P.E. teacher Orquida Labrador — Hom’s coworker and a 1987 Marshall alumnus — hurried to help her unload water bottles and doughnuts for the educators on the picket line…. It’s Los Angeles or Los Ângeles (plural of el ángel), not “Los Angles”. Leaders of United Teachers Los Angeles have announced they are ready to return the bargaining table. They said they were waiting to hear from the school district but expected bargaining to resume Thursday and continue throughout the weekend.